As we look out of the window, it feels very little like summer right now, but the seasonal fruit gracing our plates (or desks as the current situation more closely represents) tells a different tale. 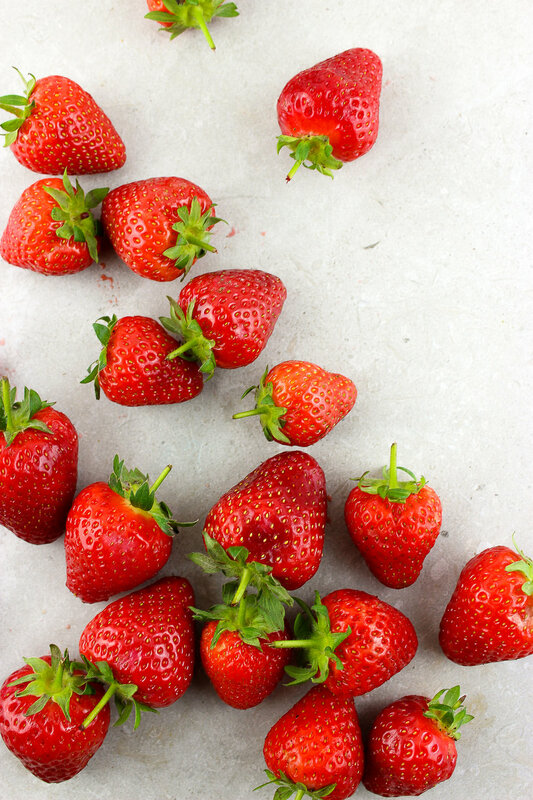 Without a doubt, juicy British grown strawberries are one of the most exciting things about the arrival of summer, and as much as we love to cook with them, there's nothing quite as exciting as strawberries fresh from the punnet - or the field if you're lucky. And maybe some of the excitement is caused by their short seasonality. Whilst it's easy to find strawberries year round in supermarkets, local British strawberries only actually have a short 6 week season on the Elsanta breed, which makes up 80% of them. Even more reason to stock up on them and freeze them though, strawberries are bursting with vitamin C and antioxidants, and lower in sugar than most fruits - not only a delicious choice, but a healthy one too. - The perfect low GI breakfast fruit - add them to the top of your porridge, serve with coyo, blend into overnight oats, add to your chia pudding, enjoy them with pancakes or add to the top of french toast. Basically add them to any sweet breakfast option and you're onto a winner. - They're also delicious blended into smoothies - strawberries, maca, almond mylk and banana is always a guaranteed winner. - A great dessert addition too. Our particular favourite is strawberry and peach crumble -the perfect way to use up any slightly past their best fruits rather than wasting them. - And of course we can't forget about the joys of strawberries and chocolate. We love avocado chocolate mousse served with fresh strawberries. - Another favourite of ours is to make them into strawberry chia jam - add it to toast or porridge, or use it in replacement of shop-bought jam in a traditional Victoria sponge cake. It's super easy to make too. Just add a punnet of strawberries to a pan and simmer until broken down then add about 1/4 tsp of chia seeds and leave in the fridge to gel together. Feel free to add extra sweetener too, but we personally don't think it needs it! - Strawberries aren't only limited to sweet - they also make the perfect addition to a salad. Try with spinach, courgetti, walnuts and a creamy tahini dressing for a simple but effective dish.